Petco is in the midst of a weekly Halloween photo competition on their Facebook page, and this week's winners looked absolutely thrilled to accept their award. 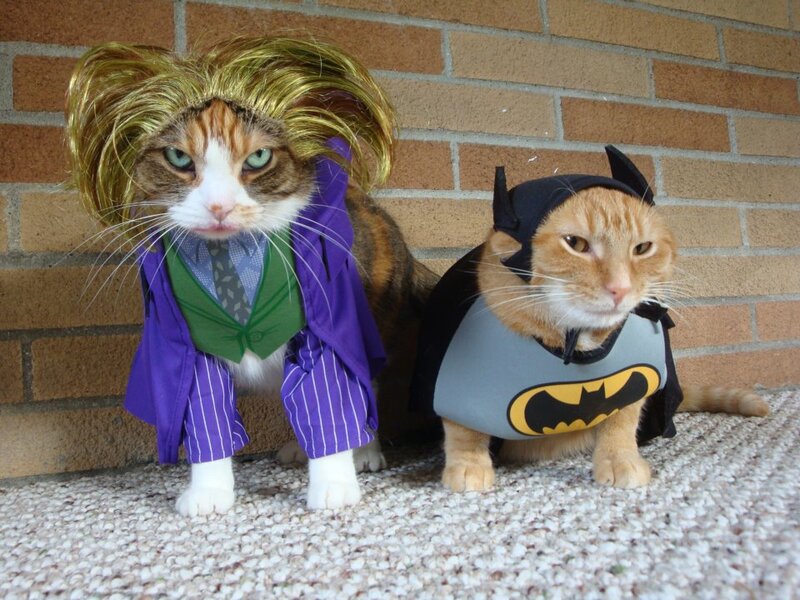 Now if only Christopher Nolan were casting an all-cat version of The Dark Knight, these guys would be a shoo-in! I can't help but think this is what Catwoman dresses her kitties up like for fun. You mean a "paw-in". haha I love these kitties so much, they're my new FB profile pic. Just darling & best costumes ever. So cute! This is relevent because the new 'BatMan' game comes out today! cruel and unusual punishment for cats!!! Look at those faces...they are plotting REVENGE! LOL! This is so funny! I absolutely love cats in costumes but my cat will not allow it at all. He goes into such a fit that I gave up even trying, but I so wish he would humor me LOL. Love this photo! OMC, don't get any ideas mum ~bad enough you stuff me in a pumpkin for face book.